There is a greenmarket in front of my office twice a week. I love checking it out to see what’s in season. When I can, I prefer to buy from them. I love the splashes of color from the stands as I walk out of the subway. It’s a nice change from the shlock vendors that stand in its place during the rest of the week. For the past few weeks, they’ve had rhubarb stalks on their tables. I’ve never tried rhubarb. Not even in a strawberry-rhubarb pie. I’ve missed out on such a classic American staple. As I walked through the tables yesterday, I eyed the stalks. I asked one of the workers how much I would need. He said 1-2 pounds would be plenty – about 4-5 stalks. A colleague mentioned that rhubarb is great in a crisp. I decided to check it out. Got to try everything once, right? We love fruit crisps in the summer. They come together easily and use what we have on hand. I wasn’t sure how this one would turn out though. It smelled good while baking, but rhubarb has a mixed reputation. I set aside a small ramekin so that I could try it. I wasn’t disappointed. It has this tangy and tartness to it that is welcome. Cut up the rhubarb, slicing it across – around 1/2 inch thick. Mix up the sliced rhubarb with the white sugar and the flour. Place in a buttered baking dish. A 9×9 would work for this. In a separate bowl, using a pastry blender, mix up the rest of the ingredients. Sprinkle the crumble over the rhubarb. Bake until the topping is golden brown. The rhubarb should be soft. It should take around 30-35 minutes. Serve while warm – with a nice scoop of ice cream. Enjoy! I have always hated shopping. As a kid, even more so. I was the worst companion at Dayton’s or City Center. I just wanted to get out of there. I do remember though, that at the end of each shopping trip to Dayton’s, the experience was sweetened by a trip to Candyland. This old school candy and popcorn emporium was some sort of tastebud paradise. A bag of popcorn or caramel corn for my sisters and I, and a bag of jujubees for my mom. Life was good. 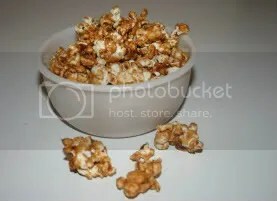 I don’t think I have had real caramel corn since once of those shopping trips, but I was reminded of the crunchy sweet goodness of the stuff the other day. While browsing the kosher grocery store on Thursday night, a woman next to me had cart full of tubs of caramel corn. I mosied on over to the aisle and saw that the tubs were $5 and that they also contained pretzels and peanuts. Huh? We didn’t need the glutens, and $5 for a small tub of popcorn and sugar seemed pretty overpriced. We always have popcorn in the house. There’s always sugar and butter as well. What more did I need? I set out to make it motzei shabbat. J is the expert at the popcorn making – so I put him to work at the stovetop. We don’t do microwave popcorn. I find it too chemical tasting. 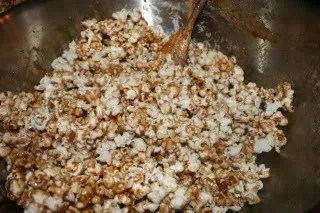 I was surprised by how easy it was to make the caramel corn. Just a few ingredients, and a few easy steps! It really is as good as I remembered. Even the kid who doesn’t like caramel loved the stuff. Place the poprcorn in the biggest mixing bowl you have. I have a few of those restaurant sized stainless steel bowls. If you don’t have them, then just throw them in to a couple of baking pans. The disposable foil 9×13’s are perfect for this. In a small saucepan, melt the butter at a medium-low heat. You do not want the butter to burn. 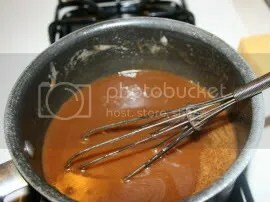 Whisk in the brown sugar, corn syrup, and the salt. Keep stirring. Turn the heat up to medium high. Let the mixture come to a boil for a few minutes. Keep stirring. Turn the heat off after a few minutes. Add in the baking soda and the vanilla. 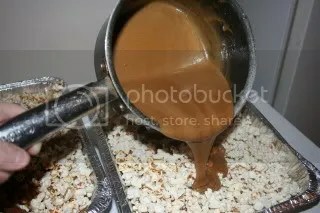 Pour the mixture over the popcorn. Stir the popcorn to coat it entirely. If you haven’t already done so, dump the popcorn in to the baking pans. Place the baking pans in the oven at 250. Stir the popcorn every 15-20 minutes. Remove from the oven after about an hour and let cool for aout 10-15 minutes. 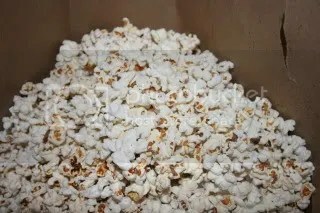 Break up the popcorn and store in an airtight container. Or eat it all up. It was be hard to fight the urge to keep eating. It’s that good! Enjoy!